macular degeneration of the eye (darker area) has recieved successful treatment. Credit@Communityeyehelthviaflickr. Human embryonic stem cell (gold) growing on a layer of supporting cells (fibroblasts). Stem cells are derived from very early embryos and can either be grown to stay in their original state or triggered to form almost any type of human cell. The fibroblasts provide special factors that maintain the stem cells in their original state. 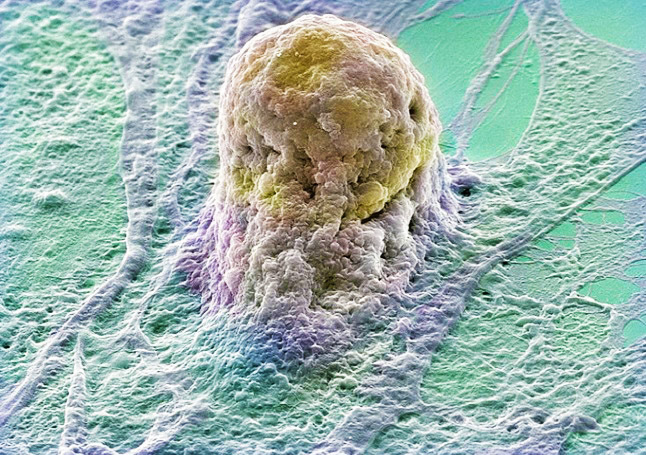 The stem cell appears to be grasped by the underlying fibroblast. Stem cell research could lead to cures for many diseases such as Parkinson’s disease, Alzheimer’s and diabetes, where a patient’s cells are damaged or absent.